This summer’s great weather continued for the open house at Uncaoonuc Mt. 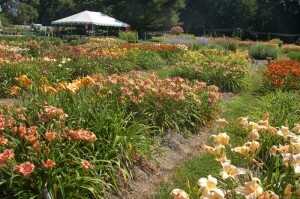 Perennials, a plant nursery in Goffstown, New Hampshire. Being the height of the summer season, the display beds and pots of plants were showing off their glorious blooms of color everywhere you looked. Although this was the first time I’d been to Uncanoonuc (pronounced un-ca-noo’-nuc), I had heard people talk about it over the years as the place to go for perennials – great quality at a reasonable price. I went with a friend this day and we met the owner almost immediately. Her name is Annette, or Nettie as she likes to be called, Rynearson. A very fit, warm, and vivacious person, she said she and her husband Mark started the nursery 32 years ago when the property was no more than pasture with a gravel pit and just a few trees. They planted buckwheat as a cover crop to start building the soil. Mark, who is a landscape architect, had the know how to create the layout of the property to best care for their pots of perennials and for the display beds that would show customers ways to use their plants. The stonework, granite slabs and outcroppings, and waterfalls that Mark designed provided the foundation for the display beds, which include a large rose garden complete with a white arbor. Nettie gave a workshop this day called “Love ‘Em & Leave ‘Em” about low-maintenance, beautiful perennials to create a “pretty yard without much fuss,” as Nettie put it. Throughout the nursery, the plants that fall into this category have labels with a green florescent dot in the corner to make it easy for the customer to spot. 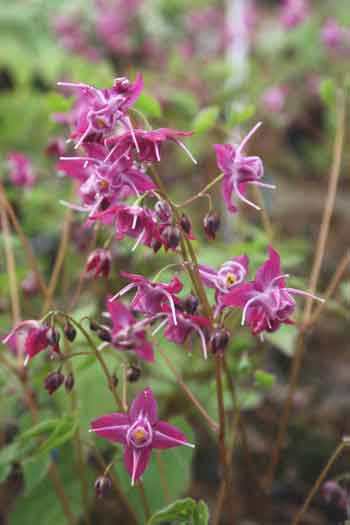 Fairy Wings, or Epimedium, which she planted 25 years ago on the property and is thriving still. 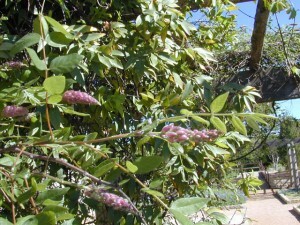 Meant for dry shade, it has delicate foliage tinged with red in the spring that turns leathery as the season progresses. 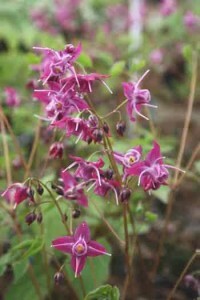 It has pink, white, yellow, or purple spires in May that resemble orchids. Makes an excellent ground cover. 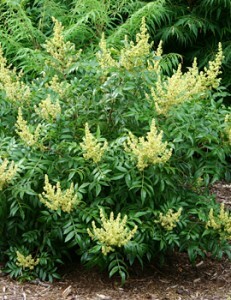 Prairie Flame Shining Sumac, which can grow to be 6 to 7 feet high and wide. 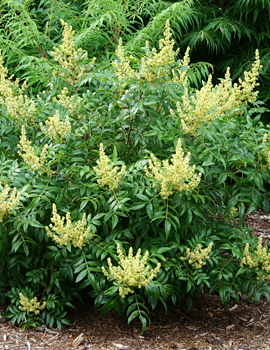 Likes sun to part shade and is tolerant of poor soil conditions. Has glossy foliage with yellow, fuzzy flowers in August and bright red foliage in the fall. American Wisteria, which blooms twice and is fragrant. 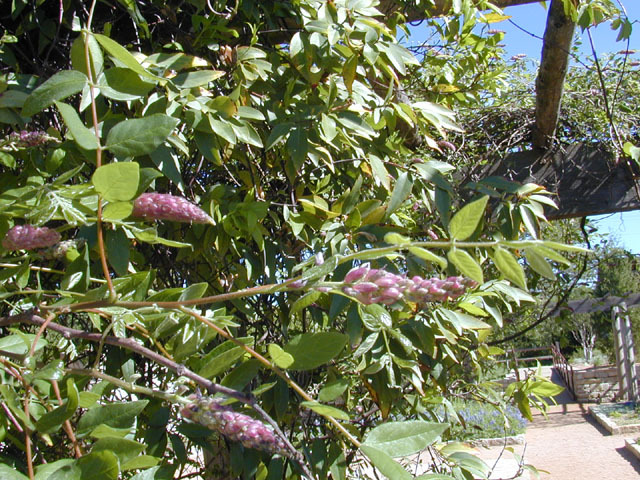 Unlike the Asian Wisteria, which can take several years before it blooms, the American Wisteria blooms within the first few years. Like all wisterias, it needs strong support. Banana Cream Shasta Daisy. Has large flowers that bloom over three months; a great cut flower. Like other daisies, does need to be divided every two years so it doesn’t get woody. First Sunshine Daylily. 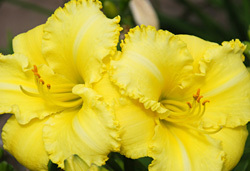 Unlike other daylilies, such as Stella D’Oro, doesn’t have to be divided every 3 years. 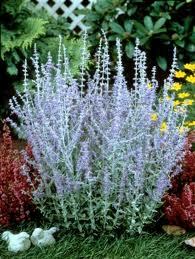 Little Spires Russian Sage. Has 6 to 8 weeks of bloom. Nice, silvery foliage that is a good for contrast with other plants. 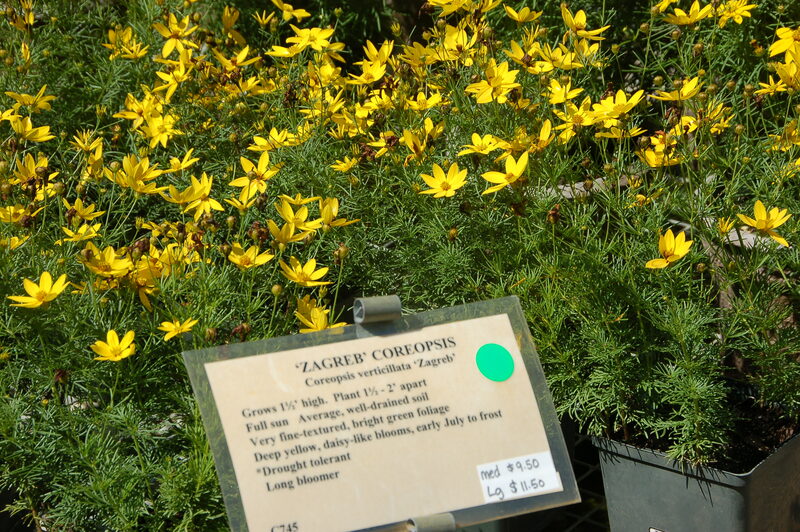 Coreopsis Zagreb is the only coreopsis that Nettie considers low-maintenance because it blooms forever without deadheading and always looks good. Goldenrod. 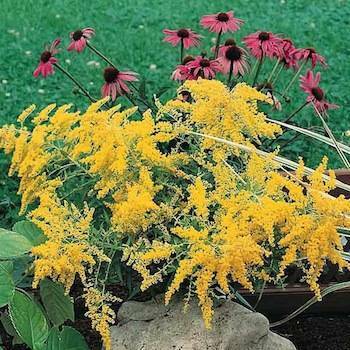 Contrary to popular belief, goldenrod does not cause hay fever. Perhaps people confuse it with ragweed. Attracts butterflies and bees, and makes nice cut flowers. You can go to http://www.uncanoonucmt.com/downpg.html for a complete list of low-maintenance perennials as well as information on a variety of gardening topics. I would recommend a trip to Uncanoonuc Mt. Perennials to not only shop for any plants you may need, but to enjoy all the displays and to talk to Nettie and the knowledgeable staff about any gardening concerns that you may have. Also, Goffstown also has a lovely downtown area with places to eat such as Putnam’s Waterview Restaurant, where my friend and I had a delicious lunch.